Think Goa! First thing comes to my mind is food especially seafood. We are just back from a much awaited Goa trip. My granny as usual prepared this delicious King Fish (Iswon) Fry and its curry soon after the Ganesh festival. Yummy! I am still drooling looking at this fish fry. Give it anytime a day, I would be happy to grab them. 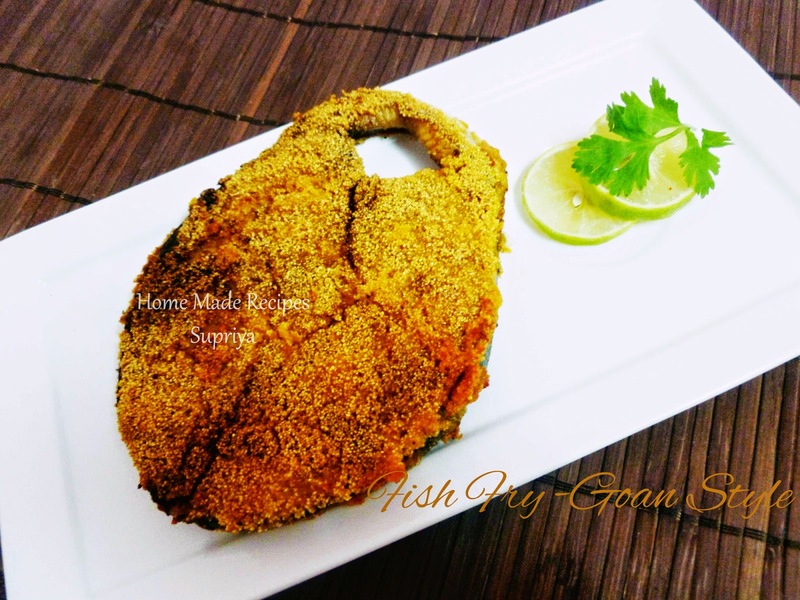 My first post in my space was also a fish fry- Rava Fish fry. I posted mackerel (Bangda) fish. Though not happy with my post then, I am not gonna delete that as it was my first post and I have learnt a lot after that. 1. Clean the fish properly. 2. Make a paste of red chilli powder, haldi, amchur powder and salt. 3. Apply the above paste to the fish and let it marinate atleast for half an hour. 4. Heat about 1 tbsp oil in a pan or tava. 5. Meanwhile coat the marinated fish with rava / sooji and place it on the tava/pan. Fry on both sides till the fish is done. Add more oil if necessary. Spicy rava fish fry is ready to be served. Note : You can use any fish instead of King Fish.